'How do you get to the City Hall?' repeated the porter in Cork's grand old Metropole Hotel. "Just out the door, turn right, then turn right again over the two bridges and it's straight in front of you. You can't miss it. It's all limestone outside and all Cork inside." He was pretty close, but only half Cork was inside. The other was in a queue outside, straddling the front of the building and twisting round the corner for as far as the eye could see. The advertisements on the entertainments page of the Cork Evening Echo told the story. Mother Goose was on in the Opera House; the cinemas offered Mark Lester in S.W.A.L.T. ; Johnny Cash in A Gunfight; Steptoe & Son and two Disney flicks - Bedknobs and Broomsticks or The Aristocats, the most exciting thing going was Buona Sera, Mrs. Campbell (billed as 'frisky and risky'). Coming soon were Thin Lizzie (sic) and Brindsley Schwarts (sic) which sounded like a highly contagious form of pimples. A small advert did, however, contain the legend: 'City Hall, Tonight, in Concert - RORY GALLAGHER - 8 pm'. It was a courtesy ad. Tonight (and last night) Rory was at home in Cork and all tickets had long ago been sold. Spotlight's man eyed the queue outside the City Hall. Instinctively, he shied away. No way! Queue? He couldn't do it. There had to be an easier method of getting inside. Outside the stage door he walked back into the shadows to take stock of the situation. Glancing up, a lighted window on the first floor took his attention. The yellowy light beckoned him like he was a moth. Behind the glass it looked warm. He walked back further and saw a figure spotlighted in the window. Rory Gallagher was sitting up there, cross legged and sipping Guinness from a paper cup. Our man traced his way back to the head of the queue and confidently bluffed his way through the heavy doors. Slowing down only to nod to the 'bouncers' (as if they'd been in his employ for years) he strolled into the auditorium. The balcony was jam packed and the main floor filling fast as he swept along the aisle, mounted the steps and picked his way backstage. Gallagher had finished his Guinness and come down. Now he was sitting hunched-up at the side of the stage watching Sleepy Hollow go through their set. He greeted the Spotlight man; both sat silently for a while soaking up the sounds of the band. Then Rory pointed towards the dressing room and they climbed the stairs and pulled the door on the world behind them. Rumours that he's an astrology freak, who won't set a foot outside the door without first consulting his mother and checking that the stars are right. Rumours...the same sort as come out about Van Morrison. They are part of a mystique. Rory Gallagher has a very private, private life and our man doesn't want to break down any barriers. What parts of the Gallagher story are true? ...He was born in Ballyshannon in Donegal, but lived in Cork since he was about twelve inches tall. He's a self-taught musician who got his first real guitar at the age of nine. It replaced a plastic Woolworth's job on which he picked out old Gene Autry and Roy Rogers tunes. At 15 he struggled to buy the Fender that he'd played all along until it was stolen recently. It was a beautiful instrument for all the battered woodwork and the peeling paint. When he slept, it lay on the floor by his bedside - like a faithful dog. Elvis, Buddy Holly, Chuck Berry, Lonnie Donegan, Leadbelly, Woody Guthrie, Muddy Waters, Lemon Jefferson, and Blind Boy Fuller were his influences on his showband days. He enjoyed playing with the bands- they let him do all the Chuck Berry songs, didn't they? That compensated for the Clancy Brothers stuff. After that came a stint in Hamburg and the Cork Taste ( with Eric Kitteringham and Norman Damery) followed by the Belfast Taste (with Richie McCracken and John Wilson). Then London called - and Europe - and the Taste albums - and the bust-up after the Isle of Wight festival. Rory was getting better all the time... now he has Gerry McAvoy on bass and Wilgar Campbell on drums. Three more albums- Rory Gallagher, Deuce and Live in Europe. (The last L.P. sold 485000 copies in this continent alone). Now its Gerry on bass, Rod DeAth on drums and Lou Martin on piano. 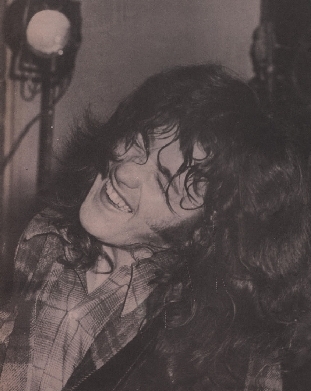 The date is December 29, 1972, Rory has lifted £3000 for the past three nights' work. There'll be another grand for him after this gig. Sleepy Hollow are getting into their last few numbers. Rory is drawing on a bottle of Guinness in the most prestigious dressing room his home town has to offer and the Spotlight man is asking him questions. Why did he work so often?....Because if he only worked one night a week, he'd forget what he'd learned the previous week. Ideally he should work every night and improve day by day. Every show had to be better than the previous one. He'd like to stay on the road all the time - to become like a hardened jewel. Money?.... He really didn't think about at all that much. Sure, he had a lot and there were all those stories back in '66 that he'd be driving a Rolls Royce in '67. Poverty was the heritage of the Irish and they wanted to read about Irishmen in Rolls Royces, but he had never really believed any of his own publicity. He didn't want a Rolls. Still doesn't even own a car. People wanted to read about how rich he was, but he would rather read one line of musical criticism than all this waffle about big cars. Did he think of himself as a Corkman or a Donegalman?.... Neither, an Irishman - although he reckoned that he was as close to being a Corkman as he could without being born there. Dis he get a special kick out of playing in Cork?.... It was the same as any other gig, except that he'd played in the clubs all around and now it was the City Hall. Cork people are very droll - a good, perceptive audience who knew what they wanted and couldn't be hyped by bad music. Donegal?....Liked to go back. They had a good sense of humour up there and he loved the smell of the grass. America?.... Great. Enjoyed playing there. He had done Madison Square Garden. And he'd been on the bill of the Bull's Island Festival - bigger than Woodstock, the biggest audience ever assembled together in history. What was it like playing before such a crowd?.... Pretty much the same as any other gig. Just like tonight in Cork. No. Wait a minute. The thing about being in stage in Cork was that it was like being in a time machine. His whole life flashed by him on stage. All his memories came flooding back. Was it the realisation of an ambition - to pack his home City Hall for two nights on the trot like this?....Not really. He didn't see any reason for champagne and cigars. He was still only trying. Ambition was still there. In no way would he think about an early retirement, although he reckoned it would be nice to settle down with a wife and kids and big fireplace. He'd hate to become a character who just went on Late Late Shows on television and talked about himself and what he had done. What was the secret of life?....Do what you want to do. Gerry, Rod and Lou had come into the dressing room to change. The time was nigh. Our man pointed himself in the direction of the hall and went in search of a seat. Sleepy Hollow had finished and Rory's brother, Donal, was playing a Rolling Stones tape through the P.A. : Have You Seen Your Mother Baby, Standing in the Shadows? The hall was bunged. Puppy-fat girls squeezed into tight jeans, their faces made out of Dresden china, their boyfriends in green ski-trooper hooded anoraks trimmed with imitation fur. There were still some beads about. The tape faded. The band came out to thunderous applause and plugged in. Rory said: 'Hello. We hope to play better tonight than we did last night! (Last night was sensational.) He skipped back and instantly began to kick out with Messing with the Kid. The floor began to throb with stamping feet.....Rory Gallagher is a stunning performer. He gave impression that he'd like to play bass, piano, and drums himself and only tolerates the band onstage....because he can't do everything himself at once. Lou Martin is a superb pianist - he has to be if he's with Rory Gallagher - and Gerry and Rod are more together now than ever before. Gallagher really has a band. He plays lengthy concerts. He wants to impress and turn people on to his music. And he gets off on it himself just as much as they do. "I'm going to my hometown, do you want to go?' he sings, slapping it out and working his audience to a fever pitch that keeps the bouncers constantly marching up and down the aisles on the watch for the outbreak of violence that just won't come. These Cork kids have nothing but frenzied love on their faces. They know that what they're hearing is ridiculously good. And they know it's coming from one of their own. They clap and shout and stamp their feet as Rory switches through songs they know well - Laundromat and Breathalyser Blues - and new songs like Seventh Son of a Seventh Son. Rory's lyrics have become more important now that he's really got his music together - "Gotta keep on moving....don't want to waste the breeze' - and it's easy to see him as a Dylan without all the limitations that Dylan had. He 'won't eat, sleep or talk - just play six-string steel guitar' and the Cork City Hall is giving him one long, loud standing ovation. It's a sea of hands clasped over a bed of heads. Rory is Caesar, back in Rome for his laurel leaves. He didn't alight on a burning bush or descend from a swirling sun....He just walked out on to the stage and set the place on fire with his magical music.